The College of Fine Arts Alumni Hall of Fame was started in 2010 as a way to publicly showcase outstanding inductees from the School of Art, School of Music, School of Theater and Dance, and the program in arts technology. Illinois State University College of Fine Arts is proud to induct Jack Schmidt, M.S. ’73, into this showcase as a dedicated artist, educator, and trailblazer for the glass making community. Schmidt was part of the studio glass movement from the very beginning. Up until 1962, glass had always been blown or molded in an industrial setting. It was during a workshop at the Toledo Museum of Art that people were brought together to establish ways for the same industrial glass processes to be brought into private studio settings. This also meant bringing these processes into the academic setting. 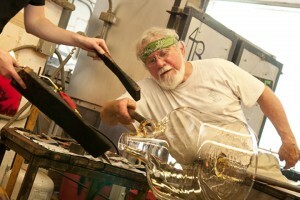 Schmidt worked in one of the first glass studios that were built at Bowling Green State University while he was an undergraduate sculpture student. In 1971 Schmidt was recruited to Illinois State by Joel Myers, Distinguished Professor of Art in the glass program, and became a key player in establishing the glass studio on campus. 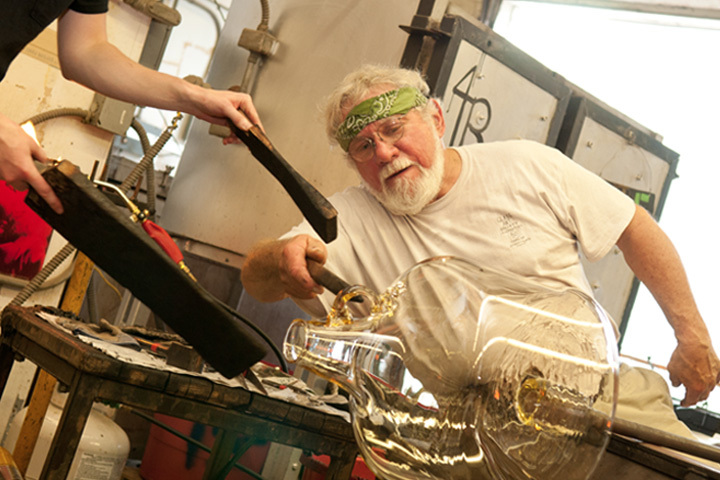 “Our first glass studio on campus was in the golf course groundskeeper’s garage out in the middle of a field—with a 100-yard driveway that went from the street up to the studio, which, if it wasn’t plowed, it was a major task just to get to class in the morning,” Schmidt said. Jack Schmidt, M.S. ’73, was one of the earliest graduates of Illinois State’s glass program. Schmidt was a member of the first graduating class in the glass program at Illinois State. After graduating, he spent the next 15 years sharing his passion for glass with many students while teaching at the University of Wisconsin, the Pilchuck Glass School in Washington, Ohio University, and the Cleveland Institute of Art, just to name a few. Although he enjoyed teaching, he wanted to prove to his students that he could make a living from making artwork. He has since occupied studios in Toledo and continues to make and exhibit work today. Schmidt has shown his work across the country, as well as in Canada, Mexico, Japan, and New Zealand. His work is included in permanent collections of the Corning Museum of Glass in Corning, New York; the Toledo Museum of Art in Toledo, Ohio; the National Museum of American Art in Washington, D.C.; the Museum Bellerive in Zurich, Switzerland; and the Chubu Institute in Nagoya, Japan. The College of Fine Arts is honoring Schmidt’s achievements with an exhibition of his work, Jack Schmidt Seeking Resolution 1968-2015, which is on view at Transpace Gallery (115 Center for the Visual Arts) through March 6. A reception will be held Thursday, March 5, from 5–7 p.m., with a College of Fine Arts Hall of Fame induction occurring during the reception. Coinciding with this exhibition is work from current students in the glass program that are working with Associate Professor John Miller. Including work from when the glass shop had a dirt floor to work that came out of the shop last week, Miller has brought together an expansive breadth of what glass artists can make. Public parking for the Transpace Gallery is available at the University Street Parking Deck, 600 South University Street.